Shaffer was a candidate for the first two rounds of the 2009 coming out of high school in Charlotte, and he dazzled scouts with his batting practice sessions because of his leveraged swing and plus raw power. But a broken hamate bone dropped him to the 25th round, and he declined to sign with the Dodgers and headed to Clemson. Three years later he was leading Clemson's offense with a .351/.481/.600 line and nine home runs, and more walks (47) than strikeouts (39), so his bat should get him into the first round. From a lean, 6-foot-3, 210-pound frame, Shaffer has big-time power that hasn't been affected by college baseball's less-potent bats. He also hits for average, succeeding even against premium velocity, and can use the whole field. He has a chance to stay at third and has the arm strength for the position, but most teams see him moving to first base. His arm and power would also profile in right field, and some teams like him better there. 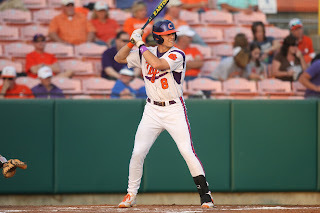 2/17/12: As a power-hitting corner infielder from Clemson, Shaffer is acknowledged as one of the top prospects in this year’s college draft class, and he’s been down this path before. Shaffer, a former PG/Aflac All-American, held essentially the same lofty draft position three years ago, heading into his senior year at a Charlotte, N.C., high school, only to tumble all the way to the 25th round when a series of hand- and hamstring-related injuries adversely impacted his season. That series of events conveniently paved the way for the 6-foot-3, 205-pound Shaffer to attend college at Clemson, and while he has enjoyed two productive seasons to date, he will face a new set of challenges as a junior as he seeks to land in the first round in June. Shaffer topped Clemson in every key power category as a sophomore—homers (13), RBIs (55), total bases (128) and slugging (.577), while also hitting .315 and drawing a team-high 44 walks—and did so with plenty of support in the middle of the Tigers batting order. With the departure of four of the team’s top hitters from a year ago, Shaffer is the only established returning bat and could be afforded much less protection this spring. He could conceivably end up being pitched around extensively. He has also been moved across the diamond to third base, after establishing himself as a superior first baseman defensively in his first two years, when he committed just three errors at the position. The hot corner is hardly new to Shaffer, however, as he played that position extensively in high school and filled in there briefly a year ago as an injury replacement. According to scouts who saw him in the fall and pre-season, he has made a smooth transition to third, displaying easy, fluid, balanced actions as he moved to the ball, along with good range and surprising ability to reach balls going to his left with his unusually long reach. It’s unclear yet whether he’ll have the footwork needed to play the position on an everyday basis at the next level. He lacks the foot speed needed to play in the middle infield. The obvious advantage that Shaffer has in moving from first to third is an opportunity to take full advantage of his superior arm strength, which was essentially wasted at first base. He was a significant pitching prospect while in high school, with a 90-plus fastball, but has not taken a turn on the mound in two years at Clemson. Not only has Shaffer impressed scouts with his velocity across the diamond, but he has greatly improved his ability to throw from different angles. The one tool that sets Shaffer aside as a prospect, though, is his raw power potential. He has homered 20 times in his two seasons at Clemson, while hitting .318 overall, and his power ranked among the very best in the Cape Cod League last summer, when he hit .263-6-22 and was second in homers. Shaffer’s power is most evident in batting practice, where he can drive balls out of the park with an easy pull/lift approach. He hits from a tall, relaxed, pro-style stance with high hands and an easy flow into the ball. Appropriately, he won the Cape League Home Run Derby against a strong field with six blasts over Fenway Park’s Green Monster. He has impressive bat speed in his athletic frame and his ceiling as a power hitter may end up becoming as great as any slugger in the 2012 college draft class, once he fully matures physically. Shaffer’s basic hitting tools are also considered some of the most polished and advanced in the college ranks. His swing tended to get a little long as a sophomore, and he would often struggle with breaking balls and spin off pitches, resulting in 53 strikeouts in 65 games. But his athleticism and exceptional hands have normally enabled him to make easy adjustments at the plate, and he has made significant strides since in tightening his swing. Everything appeared to click for him at the plate in the second half of the Cape season, and he will only enhance his chances of being drafted in the first round in June with continued improvement at the plate this spring—providing he can avoid some of the pitfalls that derailed his 2009 season in his last go-around in the draft. Shaffer, a two-time First-Team All-ACC selection, batted .336 with 10 homers, 21 doubles, two triples, 46 RBIs, 49 runs, 63 walks, a .480 on-base percentage, and eight steals in starting all 63 games in 2012. He either led Clemson or tied for the team lead in batting average, runs, hits, doubles, homers, slugging percentage (.573), walks, and on-base percentage. In his three-year career, Shaffer is hitting .325 with 30 home runs, 47 doubles, four triples, 137 RBIs, 156 runs, 125 walks, a .448 on-base percentage, and 18 stolen bases in 174 games (170 starts). Shaffer played predominantly at first base during his first two years (2010,11) at Clemson before moving over to third base for the 2012 season. In 2012, Shaffer committed only 11 errors and had a .938 fielding percentage. He became the first Tiger in history to be named First-Team All-ACC at two different infield positions over the course of a career. Richie Shaffer hit for good power in the Cape Cod League (wood bats). Only a .263 BA, but hitting for power w/ wood is important. I've read that his hitting style is a cross between David Freese and Paul Konerko. Will probably end up either at 1B or a corner OF spot.ESPN had him #11 and MLB.com #16. "Shaffer has big-time power that hasn't been affected by college baseball's less-potent bats." How are college bats less potent? I thought they use aluminum at Clemson? Before the 2011 season the NCAA adopted BBCOR standards which basically made aluminum bats perform like wooden bats. It was a big deal in last year's draft because power numbers were down and the thought was it made pitchers look too good compared to prior drafts. It made teams adjust hitters numbers up to compare them to hitters from prior years. Haven't heard about it as much for this year's draft since there have been two seasons with the new bats now. 1B/OFer with pop and a good arm.May be able to fill in some at 3rd,but NOT a MLB caliber starting 3rd baseman.  Was ranked by Baseball America as the No. 21 overall prospect in the draft, No. 2 third baseman, No. 1 out of the state of South Carolina and No. 13 among college juniors.  As a junior at Clemson University, he finished with a .336 batting average (78-for-232), 10 home runs, 46 RBI, 63 walks, a .573 slugging percentage and a .480 on-base percentage.  Ranked 11th in the ACC in batting average, fifth in slugging percentage, tied for first in walks, third in on-base percentage and tied for seventh in home runs.  Joins Evan Longoria as the only third basemen drafted in the first round by the Rays.  Becomes the 15th first-round draft pick out of Clemson and the first ever taken by the Rays.  Played predominantly first base during his first two years at Clemson (2010-11) before moving to third base for the 2012 season and was the first in Tigers history to be named First-Team All-ACC at two different infield positions during his career.  In 2011, was named Second Team All-Atlantic Region by the American Baseball Coaches Association and a First Team All-ACC selection.  The Flemington, N.J., native becomes the eighth New Jersey-born player drafted by the Rays.  Was previously drafted in the 25th round (No. 757 overall) by the Los Angeles Dodgers in 2009.  Three-time All-State selection at Providence Senior High School (N.C.) was named an AFLAC All-American as a junior in 2008 and played for the USA National team in 2007.  Was the co-captain of the Tigers this season.  Majors in Marketing at Clemson and is a two-time All-ACC Academic selection (2010-11). "Shaffer is 6'3", 205 LBS and currently playing 3B for the Clemson Tigers. He looks like a power hitter at the plate. The arm plays well at the hot corner but his reactions there are a little slow. He makes the plays that he gets to but he will not be anything better than average unless he puts in a ton of work. He isn't bad and he's light enough feet that it is possible. I believe he is the kind of guy who will do the work. I'm not saying he will be relegated to 1B but it could happen but he would be given a shot in RF would happen before that. At the plate, the bat speed is obvious. He has major league bat speed, takes good AB's and works counts. He hits the ball the other way and ropes line drives and could turn into a middle of the order bat, potentially. It's more likely that he ends up as a .270 guy with 18-20 HR's with a good share of doubles. Also, pre-draft rankings had Shaffer from 8 (Garrioch) to 21 (BA), with Jonathan Mayo (16) and PerfectGame (15) in the middle. I don't know where Keith Law had him, though. Does anyone else know where Law had him ranked?